The Bible clearly tells us that the Ark of the Covenant contained the Ten Commandments, which is the covenant. In the Bible, God used Moses as our law giver. Our forefathers believed that the laws of Old Testament were the very foundation of the American Law Code and the English Common Law. To engrave that concept into our mind, our fore fathers posted pics of Moses and the moral law throughout the US Supreme Court building. You may wish to see pictures of Moses at the US Supreme Court. This article is about Biblical covenants. Covenant, meaning a solemn contract, oath, or bond, is the customary word used to translate the Hebrew word Tiberian Hebrew bərï¿½ṯ, Standard Hebrew bərit) as it is used in the Hebrew Bible, thus it is important to all Abrahamic religions. The equivalent word in the Septuagint and the New Testament is diatheke, see also Strong's G1242. In theology and Biblical studies, the word "covenant" principally refers to any of a number of solemn agreements made between God and the Israelites in the Hebrew Bible, as well as to the New Covenant, which Christians consider to be the final fulfillment of these. Christians typically use the term "Old Covenant" to collectively refer to the covenants described in the Old Testament. God's covenants with the Israelites are foundational to the Torah, as well as to the Tanakh in general, and form the grounds for the claim that the Israelites are God's "chosen people." According to the terms of these covenants, the Israelites were told that they must worship God and obey His Commandments in order to receive spiritual and temporal blessing and avoid exposure to the effects of the curse. When the word "covenant" is used in this sense, the agreement is essentially unilateral, since while the covenant's outworkings are dependent upon human response, its terms are dictated by God. By contrast, at many points in the Hebrew Scripture, human covenants are made - in such covenants, the terms are agreed upon mutually. The Ten Commandments were carried in the Ark of the Covenant. 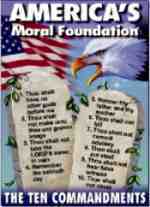 Biblical Requirement to teach kids the Ten Commandments. "And you shall put these words into your heart, and into your soul, and you shall affix them for a sign upon your hand, and it shall be unshaken before your eyes." 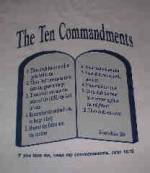 We at Ten Commandments for Kids Thank you for visiting our site. Please come back for updates to our site.